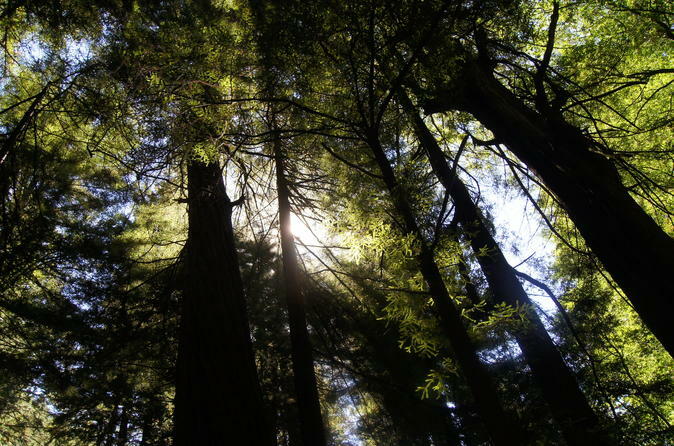 On this afternoon excursion departing at 4:30pm, venture north over the Golden Gate Bridge to an isolated canyon filled with ancient coastal redwood trees, also known as Muir Woods National Monument on this afternoon visit when the sun is just beginning to set over San Francisco. After your trek through Muir Woods, enjoy a real treat...a scenic panoramic photo stop atop Marin Headlands! On your return back to San Francisco, enjoy a real treat as we stop for a scenic photo stop at the magnificently picturesque Marin Headlands at the north side of the Golden Gate Bridge. The sun will be starting to set towards the Pacific Ocean as you savor the panoramic views of the San Francisco skyline in the distance! **Exact sunset timing subject to change day-to-day; Subject to traffic conditions and of course weather conditions and mother nature!